I might need to go back to my therapist. The other night Mark and I were having some issues with each other. While of course I've never liked fighting with my husband, I really hate it now that he's so much sicker. It feels wrong somehow. Like, why are we fighting with each other when we have so many other things to fight? 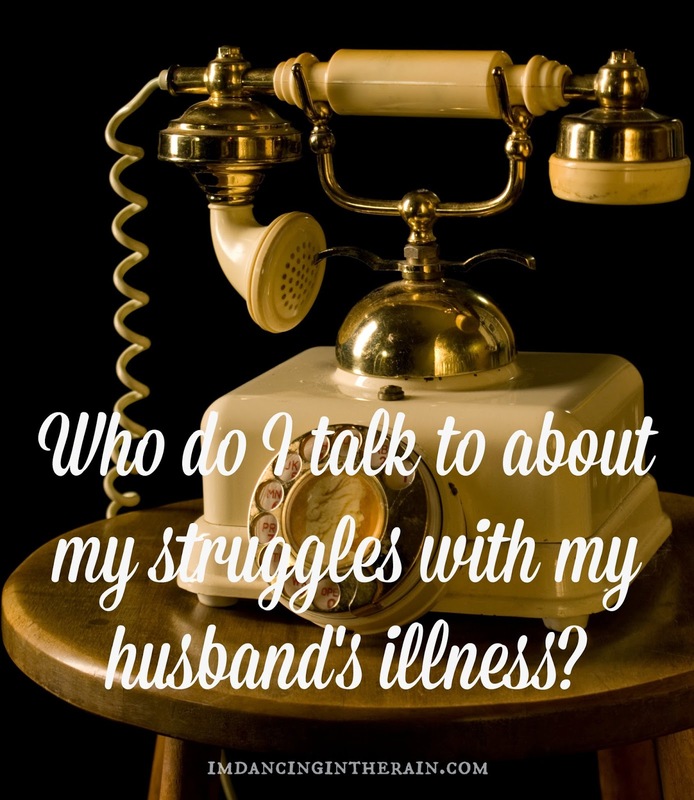 For my part (because I can't just go speaking for Mark), I am trying to balance being a loving, kind, understanding and caregiving wife to a chronically ill man with the fact that he's also still just my husband. And yeah, sometimes my husband pisses me off. Should I let him get away with saying or doing things I don't like because he's sick? Am I supposed to just roll over and let him hurt me because he could die? I also don't want to go to a friend or family member with my woes and have them feel angry with Mark on my behalf. I don't want anyone to gang up on him.....I don't need someone to solve the problem, and I know that's what people inherently want to try to do: fix it. So I didn't call anyone. And for me, that was really hard. I've never known life with Mark that didn't include stress and worry over his health. Even during the six years he had transplanted organs I was worried. Less so, but obviously transplants can fail, and he wasn't without a few complications during that time. Because this has simply been a fact of my life for the last 20 years, I sometimes forget that it's a struggle. I don't know if that makes sense. What I mean is, I forget that I am allowed to have my issues with it all, allowed to admit that it's hard and not be 100% strong 100% of the time. I have so many feelings! Writing about it helps. Tremendously. Yet, there are still some things I'm afraid to say here. I fear judgement, unsupportive comments and scaring you away. Mark has his truth(s) as he fights this battle with his body, and I have my truth(s) as I stand by caring for and loving him. As I try to also be an attentive mother and maintain other relationships. Here's one truth: Mark's health has been steadily getting worse over the past four years. There is no cure for Diabetes and he is not a candidate for another kidney transplant. He gets worse, goes into a holding pattern, gets worse, and so on. I know in my heart that I will one day sit here and write a post informing you all that he has passed away. I imagine it, and yet I can't imagine it. What I do know is, I have to talk about it and try to figure out how I'm going to deal with it.